Imagine using your smartphone to take images that compare to the quality of laboratory-grade microscopes and can be used by doctors and biomedical professionals to assess a medical sample and even recommend treatment. Researchers at UCLA developed a deep learning technique that can enhance microscopic details in photos taken by smartphones and make them comparable to high-end microscopes that costs thousands of dollars. 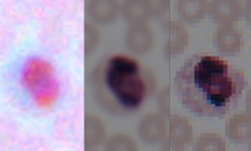 The technique, enabled by an AI algorithm, improves the resolution and color details of smartphone images, making them usable in a laboratory environment. We first told you about this research last year. Since then, the team has developed a smartphone lens attachment, which anyone can print on a 3D printer, that allows smartphones to capture better images and feed them into the deep learning system. “Using deep learning, we set out to bridge the gap in image quality between inexpensive mobile phone-based microscopes and gold-standard bench-top microscopes that use high-end lenses,” Aydogan Ozcan, Chancellor’s Professor of Electrical and Computer Engineering and Bioengineering at UCLA told the university publication. 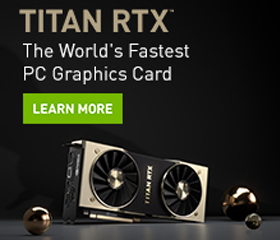 Using NVIDIA GeForce GTX 1080 GPUs and the cuDNN-accelerated TensorFlow deep learning framework, the researchers trained their neural network on thousands of photos taken by a smartphone, as well as images taken by high-end laboratory equipment. A comparison of the deep learning model that uses a smartphone photo, and a high-end laboratory-grade image. The system has the potential to be implemented in resource-poor regions, where people otherwise might not have access to high-end laboratory equipment. 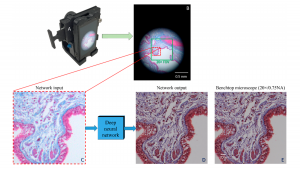 “We believe that our approach is broadly applicable to other low-cost microscopy systems that use, for example, inexpensive lenses or cameras, and could facilitate the replacement of high-end bench-top microscopes with cost-effective, mobile alternatives,” Ozcan said. The team says they have successfully tested various samples, including human tissue sections, as well as blood and pap smears. The study was published in ACS Photonics, a journal of the American Chemical Society, and builds upon previous studies by Ozcan’s group.